Diane finds pleasure watching others be the "best" they can be. She strives to continue learning something new everyday. 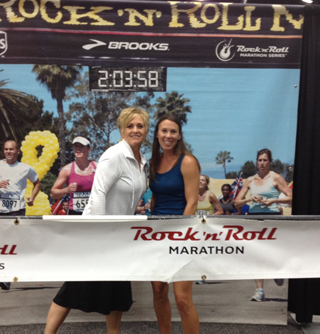 Diane and daughter, Lori at the Rock and Roll Marathon. Diane graduated from Inland Massage Institute in 2003. She opened her practice “Hand to Health Therapeutic Massage” October 2003 in Ritzville WA. Later expanding with an office in Odessa WA with Dr. Troy Eldridge Chiropractic. There she learned how well chiropractic and massage go together for a well rounded treatment program. As Diane continued her education, she found a passion for Sports massage and Orthopedic massage making them her specialty. Diane decided to open a practice in Spokane WA giving her an opportunity to work closely with Champions Sports Medicine which has allowed her to further develop her skills in orthopedic & sports massage. 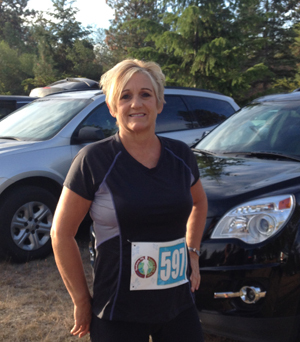 Diane also earned her reputation of quality and skill in profession by working with The WA Sports Massage Team, Seattle Seahawks training camp, personal massage therapist for two Seahawk Players during the 2006 season and volunteering in the massage tent at Ironman CDA. Diane also enjoys working with the students participating in high school sports, keeping them in the game. Another part of Diane's education has been in the treatment of headaches. She specializes in natural treatments for migraine headaches, to include cold marble facial stones and aroma therapy. Treatments can take as little as 30 minutes. Treatments can be given pre-migraine or during a migraine. Regular treatments have been known to prevent migraines. Treatments are also good for tension, sinus and cluster headaches. Diane has great compassion for people and a passion for massage therapy. She wants every person on her table to have the best experience. Whether it is treatment for an injury, pre- sporting event, post event, training or simply relaxation. Overall well being is her goal.